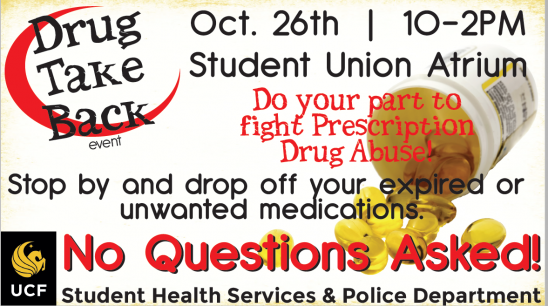 Members of the UCF community will be able to hand over their unused, expired or unwanted prescription medications with no questions asked Thursday, Oct. 26. UCF’s Drug Take Back event will take place in the Student Union Atrium from 10 a.m. until 2 p.m. People can anonymously drop off pills, inhalers, ointments and even pet medications. UCF Student Health Services and the UCF Police Department, in collaboration with the U.S. Drug Enforcement Administration, are hosting the event to prevent prescription drug abuse and theft by encouraging people to properly dispose of potentially dangerous drug. The event leads up to the DEA’s national Prescription Drug Take Back Day Saturday, Oct. 28. UCFPD stores the unwanted drugs until the DEA can pick them up and incinerate all collected items. Incineration is the safest way to destroy expired or unneeded drugs, keeping them out of the hands of abusers and protecting our waterways and landfills. Permanent drug take back boxes are located on the first floor of the Student Union and in the pharmacy of the Health Center. UCF Police officers collect items from the boxes and store them until they are picked up by the DEA. For additional information about the DEA initiative, including other local drop-off sites, visit https://www.deadiversion.usdoj.gov/drug_disposal/takeback/.